The Long Island Motor Parkway, the first ten miles of which opened in 1908, was decommissioned just thirty years later, and a section of it became a pleasure path for bicycles. Originally conceived as an automobile race course, the privately-owned toll road on Long Island, near New York City, became an uninterrupted motors-only roadway for rich socialites. The road was put out of business by a wider free-to-use road built by Robert Moses, the New York urban planner who blacktopped the city with money from the 1930s New Deal. The world’s first ‘controlled-access highway’ was closed to motorists in April 1938 and, three months later, Moses gifted part of the “Great White Way” to Long Island’s residents as the Queens Bicycle Path. It’s now part of the Brooklyn–Queens Greenway. The 48-mile road was the idea of William Kissman Vanderbilt Jr., great grandson of the Victoria railway developer, Cornelius Vanderbilt. Vanderbilt Jr was an automobile race promoter who wanted to create a motor-only road for his Vanderbilt Cup races. He financed the road with other backing from financiers and automobile companies. The Long Island Motor Parkway was costly to administer so the race course road was soon turned into a toll road for the wealthy, motoring to their estates on Long Island. 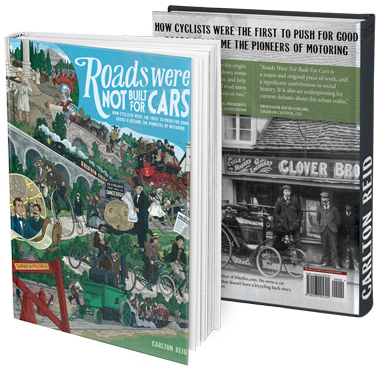 “There have been in the past highways for all kinds of vehicular traffic, canals for the movement of freight, railroads for the transportation of passengers, and trolleys for the convenience of those living in the suburbs of our large cities, but in no case has the motorist been considered. And now the day of the automobile has come. A highway is about to be constructed for its use, free from all grade crossings, dust and police surveillance, and a country opened up whose variegated charms are hard to equal in any part of the world. A speed limit of 40 mph was later introduced, and widely ignored. The road was closed to racing following the death of two mechanics at a Vanderbilt Cup race in 1910. 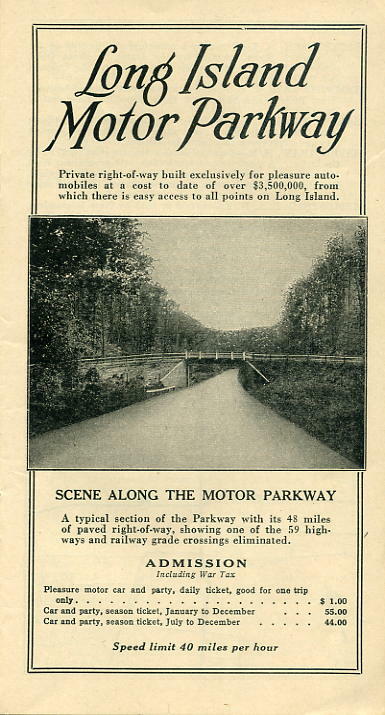 Before the First World War the Long Island Motor Parkway Corporation introduced a toll of $2 to use the road. This was reduced to a dollar when, in 1929, Moses built the nearby toll-free Northern State Parkway. The toll was dropped again to 40 cents but the road remained a loss maker and ownership transferred to local government after the road’s tax debts were absorbed in 1937. 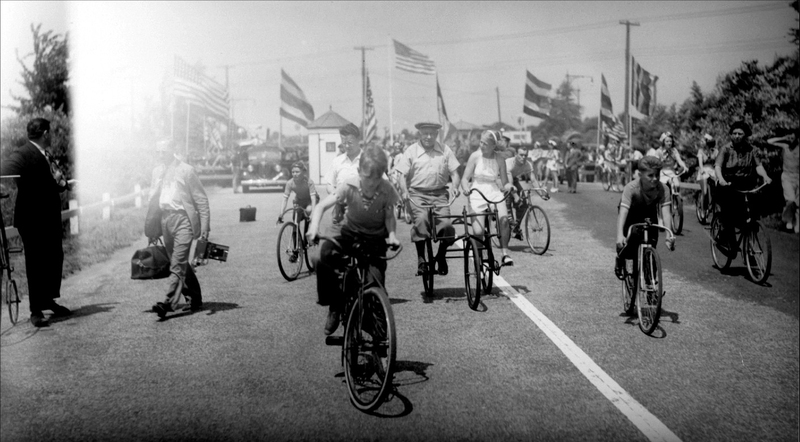 The photo below shows the opening of the Queens Bike Path. This, too, later fell out of use but parts of the bike path were resurrected in the 1980s and much of it is still rideable today, albeit gingerly. One correction: In the 1910 Vanderbilt Cup Race, two mechanicians (driving mechanics) were killed during the race. Although several spectators were injured, there were no fatalities among the over 200,00 people who watched the race. Thanks, Howard. I’ve made that change and added a link to the source. Hate to nitpick, but there’s a little typo in the story; vice president of the Long Island Motor Parkway is quoted as; ‘Arthur R. Paddington’, His last name is actually Pardington. Greg. It’s not nit-picking! I want to be 100 percent accurate so thanks for the info. I also added a link.